Facebook just can't help itself. Following news Wednesday morning that an Amtrak train full of Congressional Republicans crashed into a truck, the social media site was soon promoting conspiracy theories and lies purporting to explain the sinister forces behind the tragedy that left one person dead. For a company that has publicly and repeatedly been accused of enabling the spread of so-called "fake news," this is just yet another major misstep in a long line of missteps. First spotted by The Daily Beast's Ben Collins, Facebook's screw up du jour involved the "People Are Saying" section of Trending Topics. The phrase "Charlottesville, Virginia," which is near where the train wreck occurred, was trending, and clicking through brought a Facebook user to a page with information about the incident. Scrolling down the page just a bit would get you to the "People Are Saying" section — a collection of theoretically on-topic posts by Facebook users. Unfortunately, the posts Facebook chose to highlight promoted outlandish conspiracy theories and straight up blamed Democrats for the crash. Interestingly, Collins and this reporter were shown many of the same conspiracy-promoting messages. One such post read, in part, as follows: "The amount of vitriol the 'left' had about the Presidents [sic] address, and even people on the internet calling for his death (probably paid agitators), this could be a either a false flag or inside job." And Facebook selected that post to feature, along with another which claimed the crash was "something like radical liberal Democrats would do." The very top People Are Saying post wasn't much better and implied that Democrats might have somehow been involved in the wreck. We reached out to Facebook to determine how posts are selected to be featured in People Are Saying, and how the above posts were selected. And, shocker, the long and short of it is that no people are involved in the process on Facebook's end — suggesting that like many things at the company, it's automated. “Trending includes a separate section of people’s individual posts related to the news event; it’s essentially a comments section," explained a Facebook spokesperson. "We built this as a way for you to easily see what others are saying around a topic. The type of stuff we're seeing today is a bad experience and we're going to work to fix the product." Facebook has one of the largest megaphones on the planet, and what it chooses to do with it matters. Abdicating the selection process for People Are Saying to an algorithm does not absolve the company of responsibility when said algorithm spotlights conspiracy theories and lies. When Facebook promotes a post that claims "Democrats just sabotaged a train full of Republicans and made it crash into a garbage truck," it's doing all of us a disservice. Which, in the end, this coming from a company that has struggled to come to terms with its effect on everything from our democracy to users' mental health, shouldn't be much of a surprise. But that doesn't make it OK.
Further — and despite a promise of more transparency — the notification seems to have added to the confusion. Ars Technica’s Cyrus Farivar, who was sent one of the notification emails lamented that Twitter didn’t name names. “What exactly am I supposed to do with this email?,” Farivar asked. Most online shoppers—86% of them-- say it’s important for them to compare prices from different sellers before making a purchase. In this article, you’ll discover how to use your Facebook cover image to generate clicks that convert into leads. 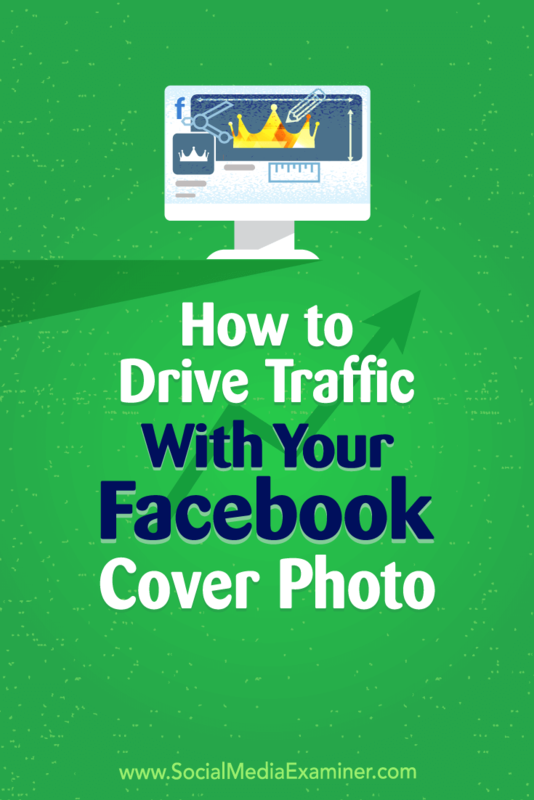 How to Drive Traffic With Your Facebook Cover Photo by Marie Page on Social Media Examiner. 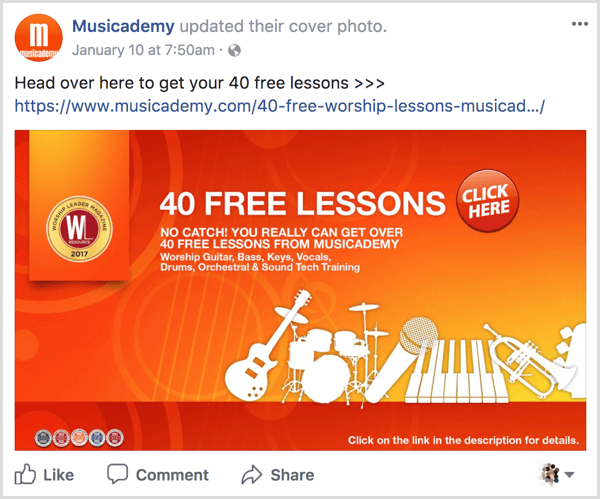 Why Use Your Facebook Cover Photo in a Lead Capture Campaign? One frustration for businesses on Facebook is that they invest lots of time and resources into building a fan base, and then the algorithm takes over. According to a Locowise study from October 2017, less than 9% of fans actually see what pages post organically. And with the Facebook Zero announcement that friends and family content will be favored over public (page) posts, businesses will likely see even less organic reach now, particularly those with content that doesn’t spark engagement. Pages will need to turn to paid ads for visibility in the feed. But what if there was another way to get more value from your existing Facebook fan base? Your cover photo can help you capture your fans’ email addresses so you have an additional platform with more control over to communicate with them. Here’s how. Your cover photo is “clickable,” as is the photo in your library. So in the photo’s description, you can add copy to direct users to your freebie (via your data capture tool). In funnel marketing terms, that freebie is known as a lead magnet. When you decide what to offer, be as generous, intriguing, and creative as you can. Make it a free offer that users simply cannot refuse to sign up for. Then create an image that shares your offer. Be sure to add a call to action (CTA) to encourage users to click the image. 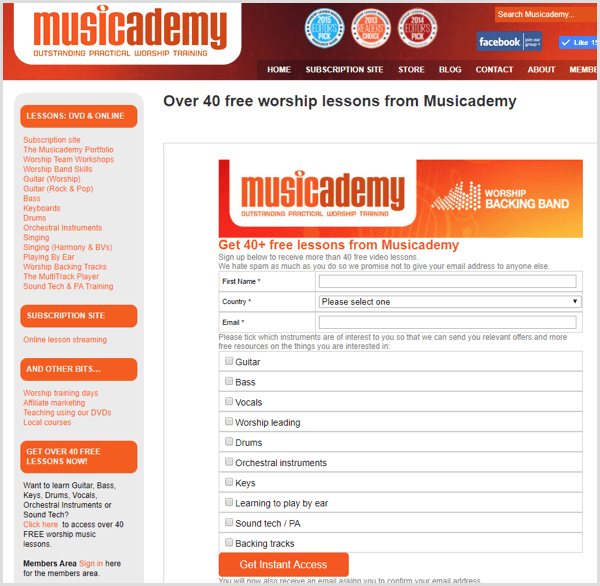 For example, Musicademy uses the cover photo above to showcase a lead magnet of 40 free music lessons. The photo also includes a “Click Here” CTA. In the description for the cover image, describe your offer and link to the landing page for the offer. This is what users will see when they click the cover image. 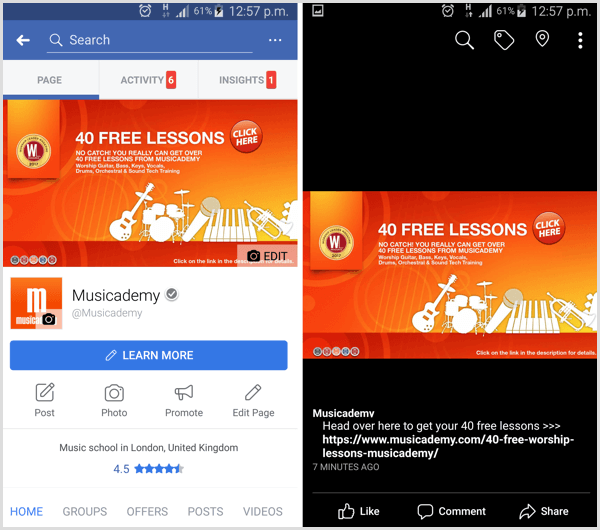 For instance, when users click the cover photo above, they see the following description with a hyperlink that directs them to the landing page where they can sign up for free lessons. Note that on mobile, the cover image is always displayed at full size, and the descriptive text appears after the image is clicked. Remember that when you change the cover photo on your Facebook page, it generates a post update in the news feed. The text that appears in the post is the text you added to the photo description. If you want more exposure, you can boost the post for a few dollars. When sizing your cover image, I recommend that you use a 16:9 aspect ratio (the same size as HD video), which equates to 1920 x 1080 pixels. That’s a much higher resolution than Facebook recommends, but it ensures your photo will be nice and crisp when viewed on Retina displays and future-proofs it for improved resolution devices. Tip: Consider using the 1920 x 1080 size for pages, groups, profiles, and event cover photos. Facebook has changed their recommendation for group sizes recently to a bizarre 1.91:1 aspect ratio. The 1920 x 1080 size is a one-size-fits-all approach, allowing you to keep things simple and consistent across placements. Be aware that Facebook will crop the picture a little at the top and bottom on desktop at this size. When you upload the photo, you can drag it up or down to designate where the crop occurs on desktop. 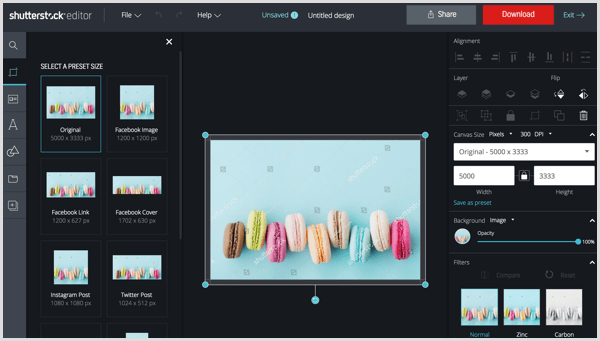 If you’re creating the cover image yourself and don’t have access to a tool such as Photoshop, check out Canva or Shutterstock’s excellent photo editor. Shutterstock doesn’t require you to use Shutterstock photos and provides lots of options for annotation. 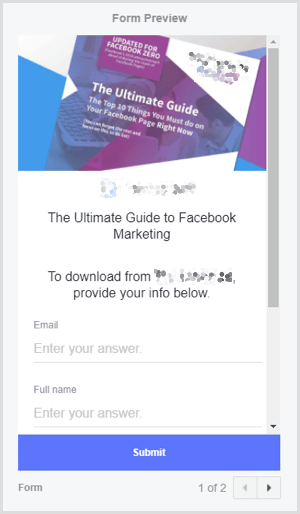 If you use pre-formatted Facebook cover templates, be aware that they could be using an outdated size. You may be better off simply creating your own custom-sized images. After you design your cover image, you need to add a data capture form to the landing page you direct users to. Musicademy has integrated an Infusionsoft data capture form on its website. After a user fills out the form, that data is synchronized with the eCRM system (Infusionsoft). 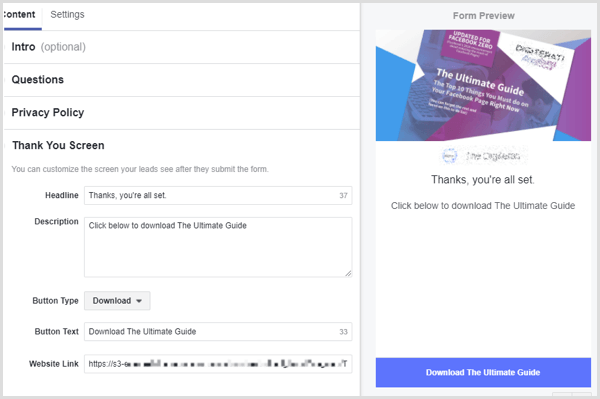 The user then enters an email funnel with free lessons and other resources relative to the information they submitted via the form. If you use a CTA button on your Facebook page, it appears immediately below the cover photo. You may find that some users click that button rather than the cover photo. If this happens, no problem. Just ensure you link the CTA button to the correct landing page and use a suitable CTA message. To illustrate, Learn More makes the most sense in relation to Musicademy’s cover image messaging in the example above. After you select your preferred button, add a URL to send users to when they click the button. When you’re finished, click Save. Your Facebook page is one of the first places people look when researching your business. Your cover photo is crucial because it’s your first opportunity to tell your business’s story. 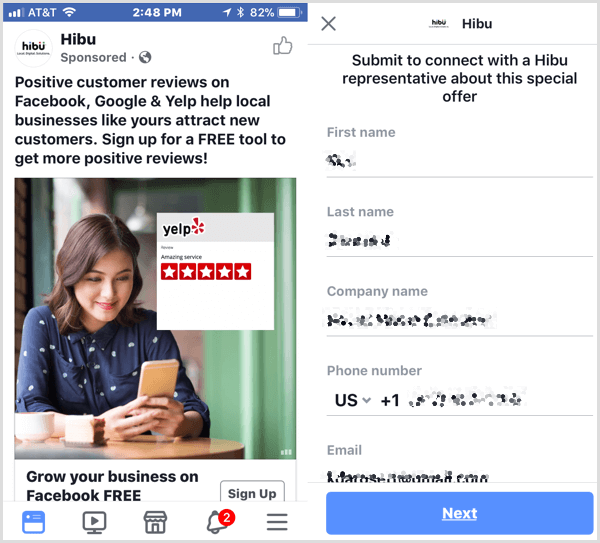 In addition to using it to promote an offer (as outlined above), you can use it to describe what your business does and for whom your products and services are designed. You might even provide social proof by highlighting awards or testimonials. Jon Loomer Digital nails the “what this page does and who it’s for” message in this cover photo. Your cover photo is also a great way to demonstrate your product offerings or promote a sale. In the cover photo below, Environ highlights a new product using a static image and copy. Of course, you also have the option to use a cover video. This animated CGI video tells Travelworld Motorhomes’ company story. 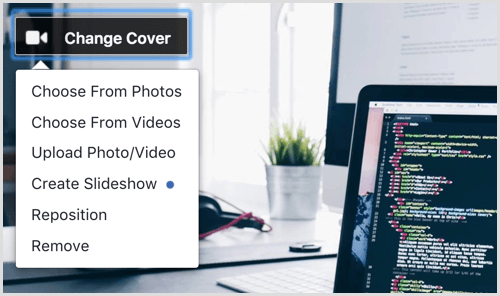 More recently, Facebook has introduced a feature that lets pages create a slideshow of static images as a cover image, which is a good alternative for companies who haven’t yet embraced video. 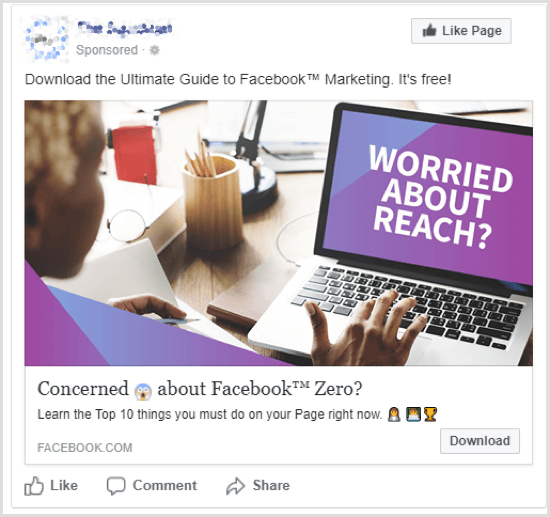 As you can see, your Facebook cover photo can help you drive traffic to your website and generate leads for your business. Right after you upload your cover photo, click on it and write some descriptive text to promote your offer. Also include a link to your landing page where your data capture happens and users click to get their reward (the lead magnet). Be sure to update your cover photo regularly with a wide variety of content. What do you think? Will you use your Facebook cover photo to promote a lead magnet? Do you have any tips for getting more out of your cover photo? Please share your thoughts in the comments below. It’s easy to think that since you spend all your time on Facebook, chatting with your friends, or Instagramming your dinner, you’d be perfect as a Social Media Manager. This is a common misconception, but the truth is, being effective in this role takes a lot more than time spent sharing Lolcats and inspirational quotes. It might be perfectly acceptable to use slang terms and txt spk on your personal profiles, but if you are representing a brand, you need to know where to put your apostrophes! On a personal social media account, it doesn’t matter when you update your profile, or if you get distracted and don’t post anything for a few days. If you’re managing social media for a business though, you need to not only post regularly, but also have some continuity of content. For example, you might follow a theme for a few weeks, mention celebration days, as well as come up with brand new content on a regular basis. All of this requires a discipline and organisation that’s not necessary when updating your own personal social media accounts. It’s easy to think that being a Social Media Manager is the perfect job for someone who doesn’t enjoy the company of others. After all, it is a job based on the Internet. However, you really do need to be good with people. Unlike your personal social media accounts, where you can respond flippantly and even argue a point with your friends if you feel like it, when you are the voice of a brand, you need to be able to keep your emotions and opinions to yourself and respond effectively and professionally to customers. As well as an excellent grasp of the English language, as mentioned above, you also need to be able to apply this in several different ways. This includes the obvious tasks of crafting engaging social media posts, but also populating profile pages and creating compelling ad copy to drive both engagement and clicks. You might enjoy sharing images on your own social media accounts, but when you’re managing social media for a brand, you will need to create your own branded graphics. This is not as simple as using an app to plonk a quote on top of a photo. Your graphics need to be engaging, interesting, professional looking and on-brand. This can take a lot of work and skill! These days, social media is all about the video content, especially live video. Therefore, when you’re managing a social media account, you will need to be able to create engaging and interesting video content. This might be those clever cut-together videos showing how to make a meal or craft project, or perhaps a live video where you go on camera to explain a new product or idea for your brand. Either way, you can’t manage social media effectively without a little camera work. Hootsuite Academy has some great social media certifications that will stand you in good stead, and the Digital Mums social media training course is very well respected too. There are lots of different courses out there though, and it’s important that before investing in any, you investigate and make sure they are reputable qualifications which will teach you what you need to know. Check out testimonials and go by personal recommendations wherever possible. There are lots of these available all the time. You’ll often see them advertised on your Facebook newsfeed, or on Twitter. Since they’re free, they will only cost you your time, and you may learn valuable nuggets of information. Social media is constantly changing, so even if you get a good qualification, you will still need to stay up-to-date. Websites like Social Media Explorer are updated regularly with helpful and insightful articles. It’s also worth keeping an eye on sites like the Facebook Newsroom and the Twitter blog for announcements. Set up your own professional social media channels and run them. This will allow you to try out new approaches and ideas, as well as providing proof to prospective businesses or clients that you know what you’re doing. Are you an aspiring Social Media Manager? Let us know if you have any additional tips that you think will help other readers! The post Do You Have What it Takes to Be a Social Media Manager? appeared first on Social Media Explorer. 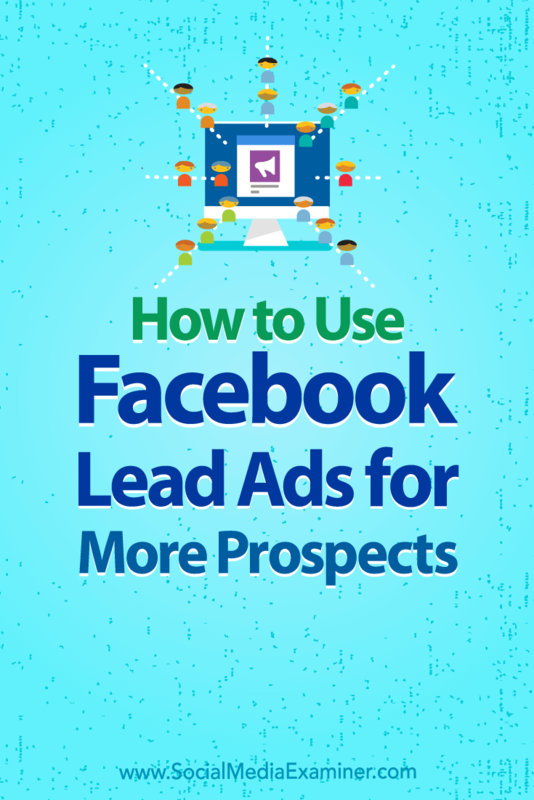 How to Use Facebook Lead Ads for More Prospects by Marie Page on Social Media Examiner. 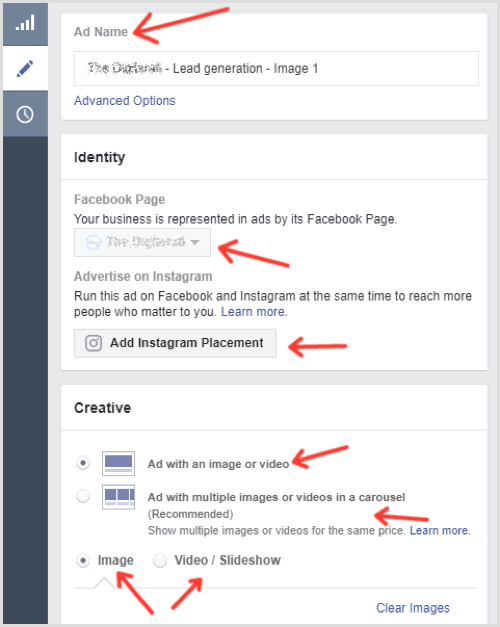 Lead ads contain two integrated elements: the ad and the lead form, which is hosted by Facebook or Instagram. On the lead ad’s contact form, you can request an email address and other contact information from the people who click your ad. When you create the form, you can choose from a variety of questions or create your own custom questions. Many B2B companies are wary of using Facebook as an advertising platform. They see it as a B2C medium and therefore ignore the opportunities it offers. But people who work in those businesses are also on Facebook, and they respond pretty well to business-related ads. In fact, when my business ran a split test campaign between Facebook and LinkedIn (using nearly identical ads and targeting) for a client recently, the results were much better with Facebook at a fraction of LinkedIn’s price. 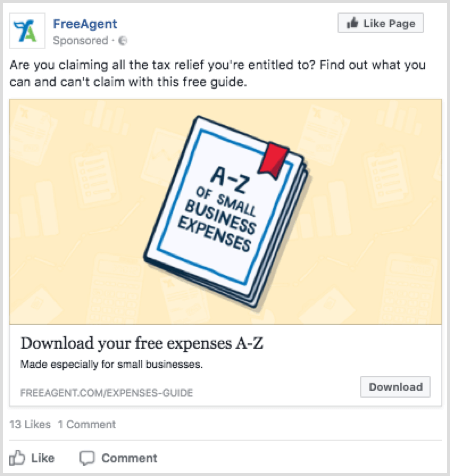 For example, FreeAgent provides software for small businesses and self-employed people so their lead magnets are perfectly suited to address the pain points of their target audience. It’s unlikely the ads will generate clicks from people outside the target audience, so the lead gen ads work to deliver qualified warm leads. The company then follows up with email marketing, a sales call, retargeting, or another creative approach. People need a good reason to part with their personal information, so choose an enticing lead magnet that will appeal to your target audience. Offer something exclusive that solves your prospect’s problem. Get creative with your lead magnet. Think beyond the classic freebie download approach to find something that works for your company and your potential customers. 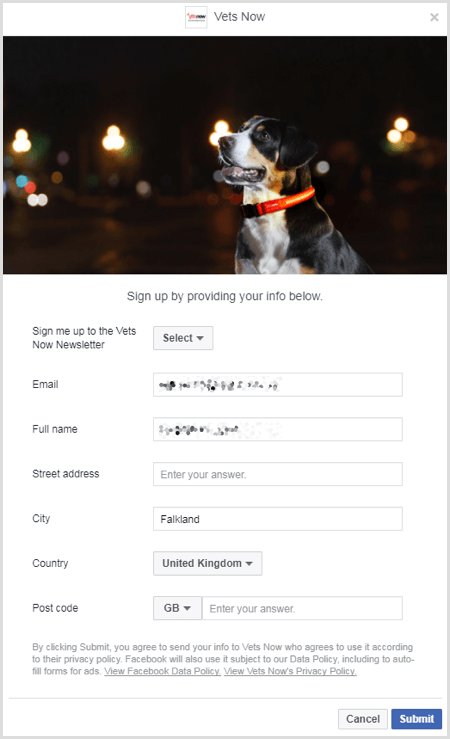 Pet Emergency Service Vets Now ran a great lead gen campaign last fall. They offered a free flashing collar to dog owners. The campaign’s objective was to capture information that would help the company better target an upcoming holiday campaign. It was so successful that they ran the ad for only a few days and with a minimal budget. 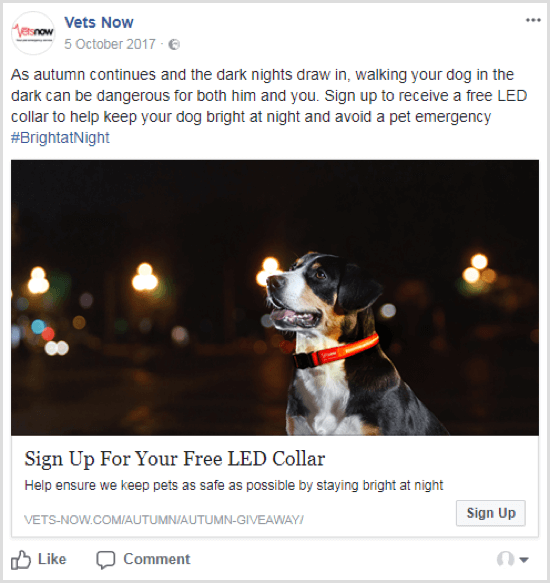 The ads were targeted to a lookalike audience of Vets Now’s existing email list (mainly historic, organic signups) and a lookalike audience of those who have visited dog-related content on the website. In just 4 days, the campaign resulted in 377 leads and a reach of 11,504. The cost was $0.27 per lead form and the ads had a superb relevancy score of 9. The entire campaign cost about $100. When planning your lead gen campaign, you must decide what information to ask for on the lead form. Typically, the more questions you ask, the less likely people are to complete the form, so include only need-to-know questions on your form. Facebook lets you choose from options like email, name, phone number (Instagram only), address, date of birth, gender, company name, and more. In addition, you can add up to 15 custom questions on the form. Below is the lead form that Vets Now used for their campaign. The company asked for a physical address so they could mail the free collar to the user. Ask for that level of detail only if the address is essential. And, of course, you can easily target the ad to a specific geographic location so people from outside your area don’t see it. 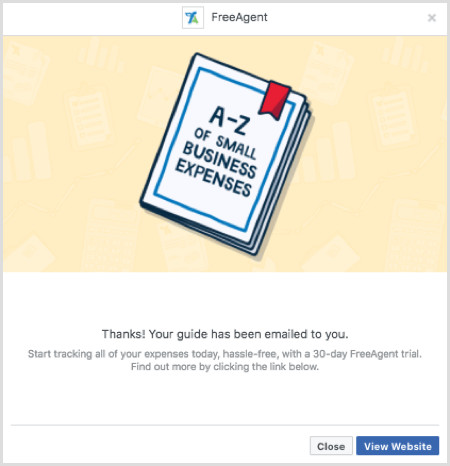 For the campaign below, FreeAgent asked for only an email address because that’s all they needed to meet the objectives of their campaign. After users submitted the form, the screen displayed a confirmation message that their freebie was being sent. An image for the ad. You also have the option to use the Shutterstock images free of charge during the ad creation process. Make sure you comply with the 20% text rule, unless you’re prepared to pay extra and get less reach. The information you plan to ask for on the lead form. An idea of whom you’ll be targeting. If these are custom or lookalike audiences, set them up. You can create your lead ad either from your page or from Ads Manager. These steps walk you through how to use Ads Manager. In Ads Manager, click Create Campaign, name your ad set, and choose the Lead Generation objective. Select the Create Split Test checkbox if you want to do split testing. Now you’re at the Ad Set level. 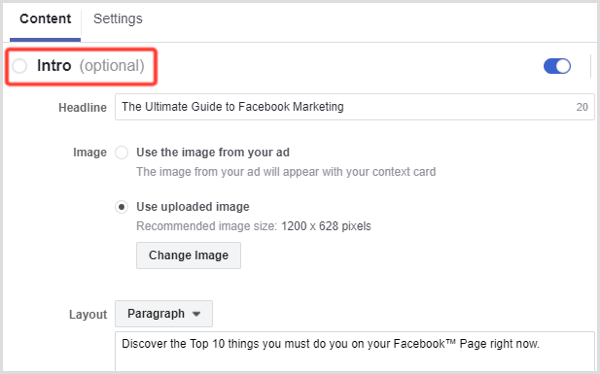 Name your ad set (I recommend using words to describe whom you’re targeting) and select the Facebook page you’re collecting leads for. Agree to the Terms and Conditions if you haven’t already done so. Then choose your budget and schedule. Choose your audience and placements as you would for other ad types. Note that you must target people over 18 with lead ads. In this example, I’m including and excluding some custom audiences. You can also layer in demographic, interest, and behavioral targeting instead of or on top of your custom audiences. 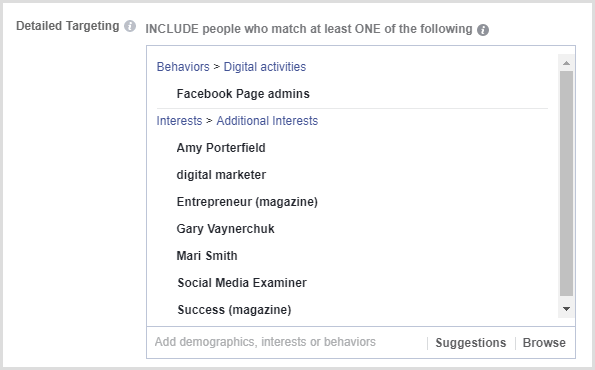 With the Connections option, you can target your Facebook fans and other variables if you want. This is helpful if you want to get email address details, too; however, this needs to be in a separate ad set from your other targets. 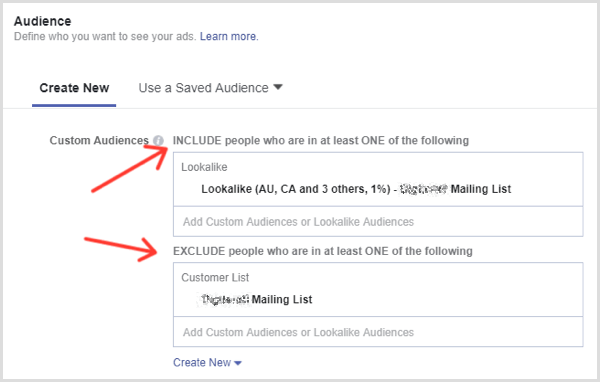 I suggest you add a custom audience of your existing database to the exclusion list with all ad sets because you already have those email addresses. Click Continue to move on to the Ads level. Choose an ad name and under Identity, select your page and your Instagram account, if applicable. Select an ad format and upload your videos and images. You can use a broad range of creative assets in lead ads: a static image, carousel, panorama or 360 photo, or video. Images should be in JPG or PNG format with an image ratio of 9:16 to 16:9. Carousels can include from 2 to 10 cards, and static images and video. Remember with carousels, you get the option to write copy under each card. The usual specifications for carousels apply. Next, add a headline and text. Headlines are limited to 25 characters and link descriptions can’t exceed 30 characters. Remember that copy can be truncated in some placements. Also choose a CTA button. You can choose from six options: Sign Up, Subscribe, Learn More, Apply Now, Get Quote, and Download. Tip: You’ll notice some emojis in this example. 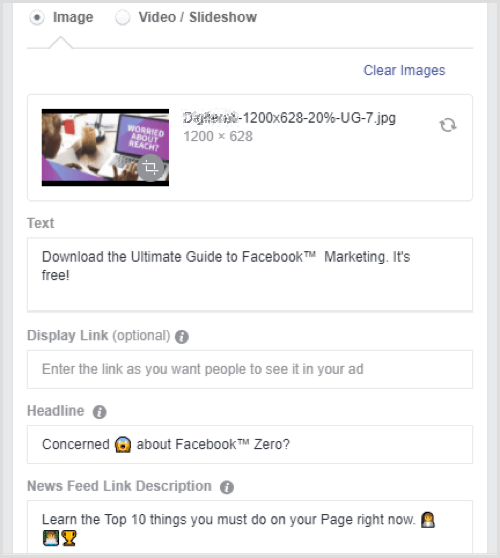 To add emojis to your ad copy, create a personal Facebook post (set the target audience to Me Only) and add your emojis. Then copy and paste the post with emojis into your ad. You can create up to six ads at once by uploading multiple images. If you don’t have an image, you can choose one of the stock images. Click Show Advanced Options to add the Facebook pixel. In the Lead Form section, click + New Form to create a new lead form, or click Duplicate to select a form you’ve previously created. Alternatively, select a draft and edit a lead form you’ve previously saved. 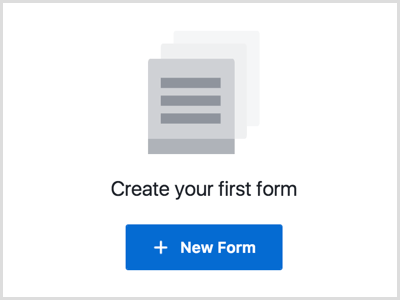 If you need to create a new form, click the pencil icon in the top left (it’s currently called Untitled Form) and give your lead form a name. On the Content tab, click Intro (Optional) and toggle the button to add an introduction screen to your lead ad. Type in the headline, choose an image, and enter information about your product/download under Layout. You’ll see a preview of the ad on the right. 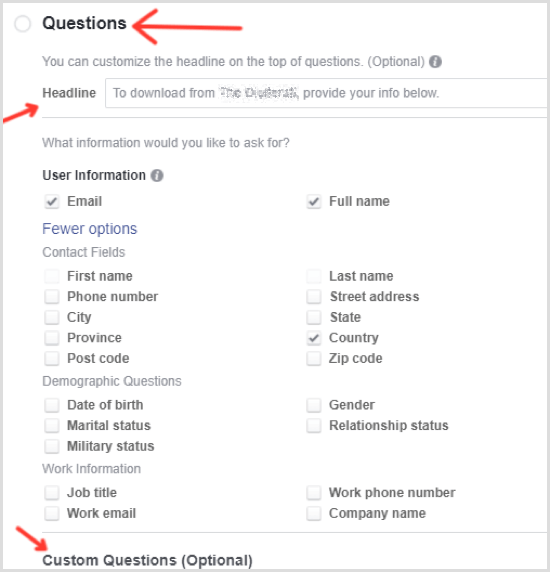 Click Questions, and then customize the headline or use the one that Facebook suggests. Check the boxes for the information you want to collect from users on your form. To add custom questions, click + Custom Questions at the bottom of the screen. Here’s a variant that includes an image and some custom text. It’s a good idea to add an image of what users will receive when they sign up. You can choose a paragraph of text or bullet points in the layout field. It’s always good to reinforce the benefits of clicking the Submit button. Click Thank You Screen to customize the screen that users see after they submit the lead form. You can choose a headline, description, button type (to send people to a website or to access a download), and the CTA. Click at the bottom of the form preview to see how your form will look. Click Finish to complete your lead form or click Save to return to it later. When you’re ready for the ad to go live, click Place Order. 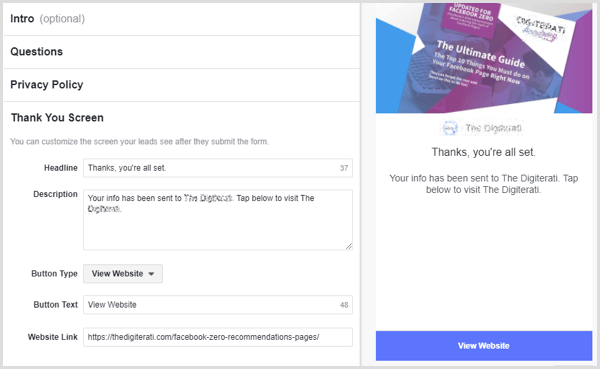 Your ad will now go into the approval process, which you’ll be familiar with from other campaigns. If you’ve integrated your leads with your CRM, you’ll get them delivered directly to your CRM system. If not, you’ll be able to download a CSV file from Ads Manager, which is where you can also see your results. Facebook supports a large number of CRM and email systems: MailChimp, Salesforce, Zapier, Zoho Social, HubSpot, and more. 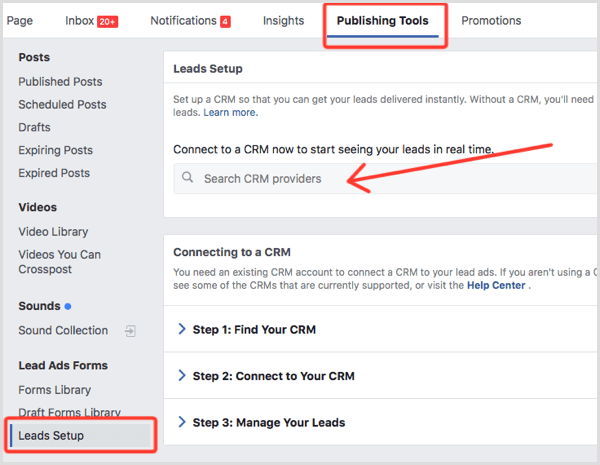 To integrate your data capture with your CRM, return to your Facebook page, click Publishing Tools at the top, and click Leads Setup on the left. 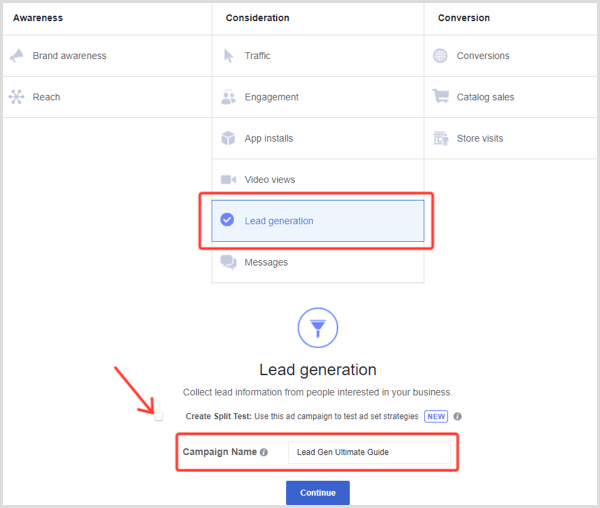 If your CRM or email software isn’t supported by Facebook lead ads, you can either manually download the CSV file from Facebook and upload to your CRM, or use a bridging app such as LeadsBridge to sync the data. LeadsBridge is easy to use and starts at $260 a year. You can test drive it by signing up for a 7-day free trial. Make your lead magnet irresistible to your audience. Get your targeting right. 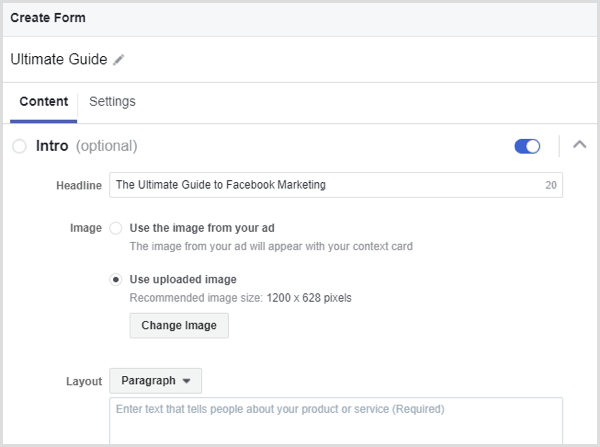 Consider targeting fans, website visitors, competitor fans, lookalike audiences, and the gamut of other targeting options that Facebook offers. Spend time developing your assets. Design your download to look professional and use a style that matches your brand. Choose an attention-grabbing photo. Use video in your ad. I’m finding that videos with ads have lower costs and higher conversions; there’s an advertising algorithm with some similarities to the news feed algorithm. Don’t forget to use captions (80% of users watch video with the sound off). Write compelling headlines and copy for the ad. Don’t ask for too much information on the lead form. Follow up your new leads with emails, phone calls, and a great set of supplementary offers, valuable information, and other relevant content. 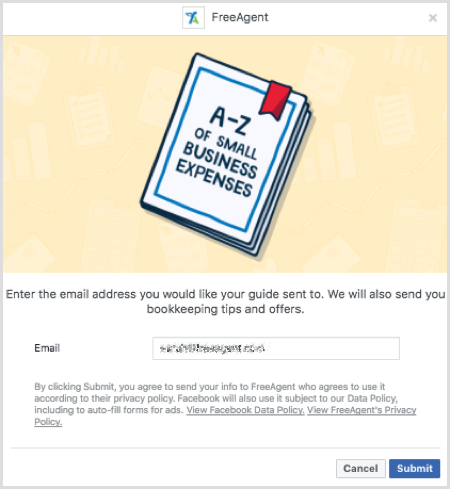 Facebook and Instagram lead generation ads are designed to easily collect email addresses and other information from users. The lead ad consists of an image, video, or carousel followed by a lead form when the user clicks the ad. Obviously, you need to dangle a nice incentive to encourage users to provide that information. Lead ads are simple to set up and with the right creative assets, they can deliver warm leads for your business. What do you think? 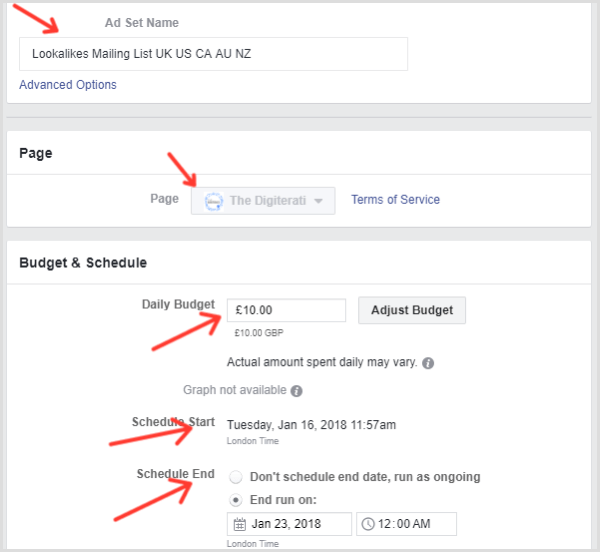 Have you tried Facebook lead ads? If so, how have they worked for your business? Please share your thoughts in the comments below. That means well over half of the world’s population is now online, with the latest data showing that nearly a quarter of a billion new users came online for the first time in 2017. But what does this mean for the world of social media? 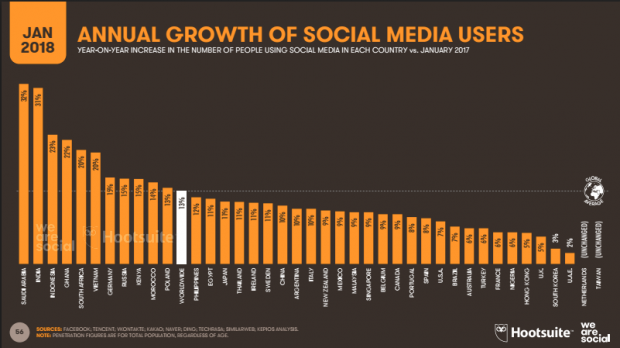 Alongside internet usage, social media use also continues to grow rapidly. 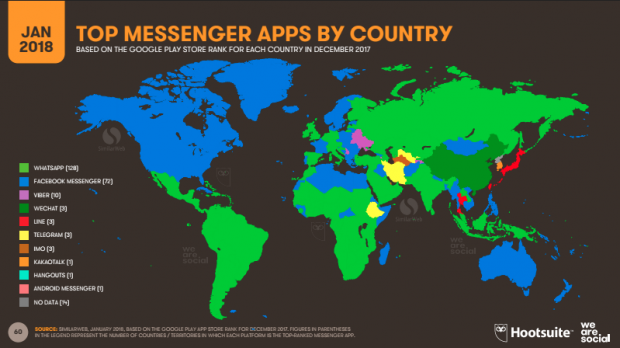 The number of people using the top platform in each country has increased by almost 1 million new users every day during the past 12 months. More than 3 billion people around the world now use social media each month, with nine in 10 of those users accessing their chosen platforms on mobile devices. So, what does all of their valuable data tell us? Here are a few highlights. Almost 1 million people started using social media for the first time every day in 2017 — that’s equivalent to more than 11 new users every second. 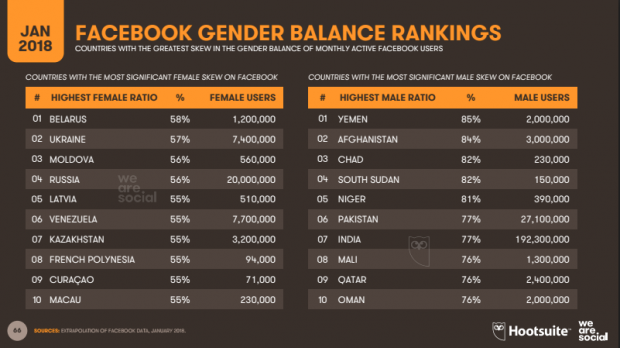 Gender ratios remain a concern across the internet, with the latest data from Facebook suggesting that women are still significantly underrepresented across much of Central Africa, the Middle East, and Southern Asia. 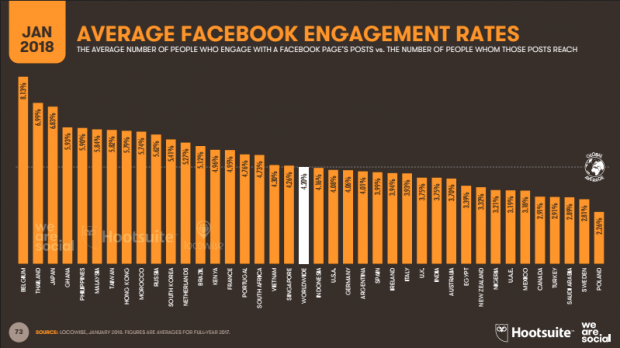 For the third year in a row, Filipinos spend the greatest amount of time on social media. 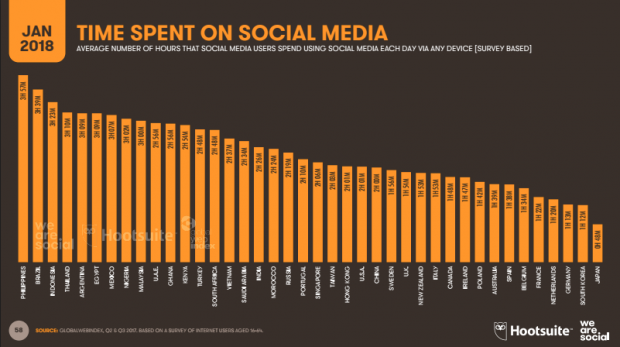 The average user in the country spends almost 4 hours on social every day. 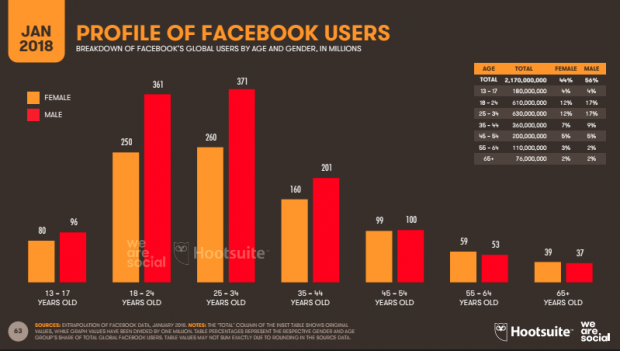 Facebook’s core platform still dominates the global social landscape. Total users are up 15 percent year-on-year, reaching almost 2.17 billion at the start of 2018. 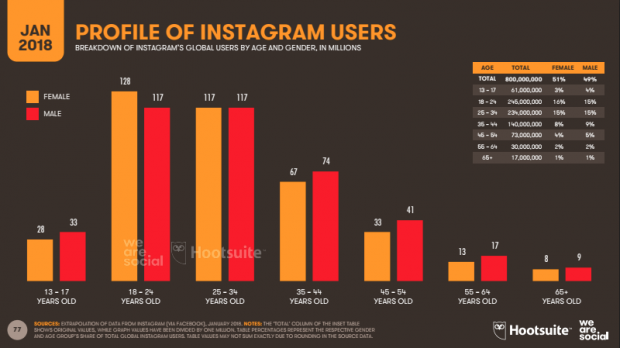 Despite these impressive messenger stats, Instagram managed to claim Facebook’s standout growth story over the past 12 months, with the number of global users up by a third. Despite the depressing trends, these numbers will be valuable benchmarks for marketers everywhere – especially because they offer insights into the number of brands using paid media. 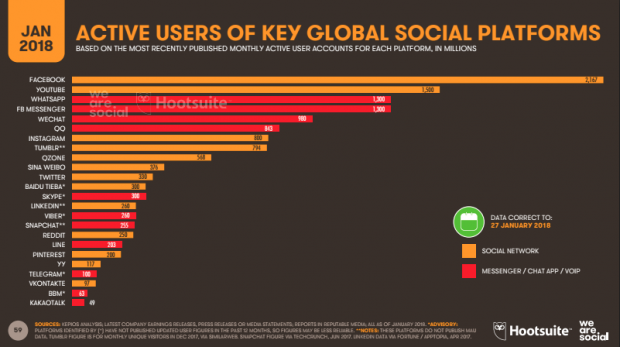 We’ve highlighted a small selection of interesting social media data for this post, but it only represents a sliver of the data you’ll find in the complete suite of 2018 Global Digital reports—which also covers global internet and mobile usage growth. These reports provide 5,000 charts worth of in-depth data for more than 230 countries and territories, including all the essential numbers social teams need to understand current internet, social media, and mobile behaviours all around the world. Download the 2018 Global Digital reports for free here. If data and charts aren’t your thing, check out the 2018 Digital Yearbook for the most important local headlines. The post 11 New People Join Social Media Every Second (And Other Impressive Stats) appeared first on Hootsuite Social Media Management.